With the newbuilding Esvagt Dana, ESVAGT aims straight for the dynamic market for SOV vessels. 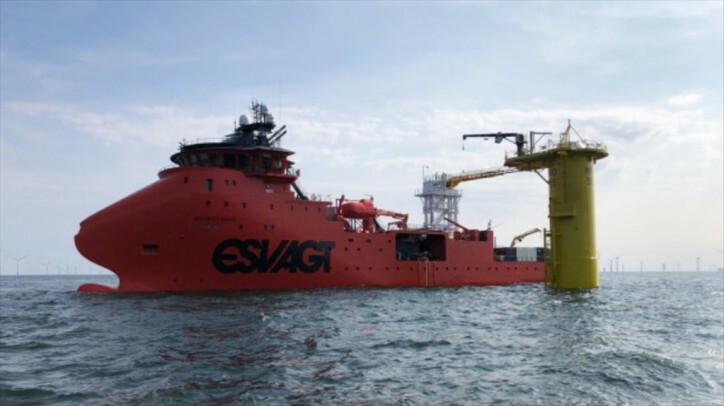 When the ‘Esvagt Dana’ entered into contract with Vattenfall on the Horns Rev III wind farm in the middle of February, it was on an atypically short Service Operation Vessel (SOV) contract. ‘The choice of SOV vessels available for short contracts is very limited’, says Ib Hansen, Head of Commercial at ESVAGT: ‘We see that there is potential in offering an SOV with ESVAGT’s competences and concept to a market that is more dynamic’, he evaluates. ‘The vessel has a centrally placed crane which can operate towards both sides, and the gangway system can similarly operate from both port and starboard. This presents potential for much faster tempering and streamlining of both transfers of cargo and of personnel without compromising safety. The client and crew have succeeded in taking advantage of this potential’, adds Ib Hansen. A contributing factor to the efficient operation is an increased utilisation of the STB12. It is used for both ordinary transfers and for those transfers where the gangway system isn’t usable. ‘For example, if the weather is foggy, thus hindering us in approaching the wind turbine by vessel, or if we cannot use the Walk-to-Work system due to work on the wind turbine, our STB12 can thankfully do the job. This has supported making the entire operation highly efficient’, says Ib Hansen. ‘Day-to-day work is flawless. We are often praised for our accommodation with the single cabins and en suite bathrooms. Anyone who has tried working shifts with hot bedding knows that this is a real bonus. Not least when particularly bad weather prevents us from working on the wind turbines’, says Viggo Hvidberg.